Clearly these shorts have become a summer favorite as this is my fourth version of these cute shorts within a few short months. The Itch-to-Stitch Belize Shorts have a flat interfaced front, with the elastic casing beginning at the hip/inset pocket seams and running through the back. I made view B again. Not needing much fabric, these were cut from remnants of an in-progress dress and sewn up in a short afternoon. Love, love, love this floral linen blend fabric recently purchased from the nearby All About Fabrics textile outlet store. Even though I love my fabric, it seemed like it could be a little coarse against my skin in the waistband area. So I measured the waistband in half lengthwise and added a seam allowance, cut a piece out of the linen blend and a piece out of soft 100% white cotton fabric from the stash, sewed the two right sides together and understitched and voila'! A new waistband piece with the soft cotton next to my skin. Now that these are made and I am wearing them, it's clear this was a very good thing to do as they are oh-so-soft against the skin and quite comfortable to wear in every way. Back view. Not tucking many tops in now, you'd never know there's elastic-casing under there. These have the BEST pockets! Nice and deep, yet flat and not bulky at all. 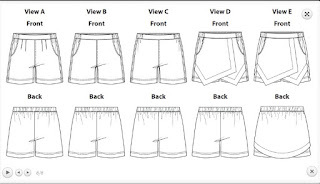 BurdaStyle calls this type of pocket Hip Pockets, also known as Inset Pockets. I am preferring this sort of pocket to an in-seam pocket on my pants. Because I was running out of fabric, the pocket piece is obviously the linen blend fabric, but the pocket facing is the same white cotton I used to line the waistband. Works perfectly here too! And because of this project, am realizing I need to keep a stock of quality soft 100% white cotton for these very reasons. You can see version 1 out of vintage cotton, 2 out of quilting cotton, and 3 out of white twill with back pockets added. 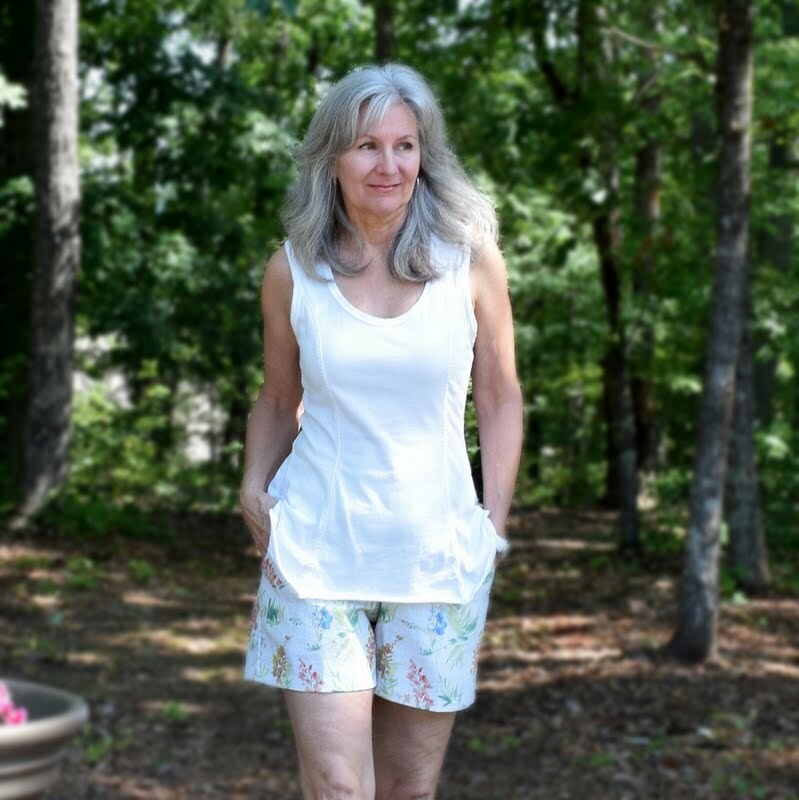 Wearing the Alabama Chanin hand-stitched 6-panel tank top today. Once upon a time, the Greenville, South Carolina area was known as the Textile Capital of the World..... though not anymore as most of our manufacturing companies have relocated overseas. 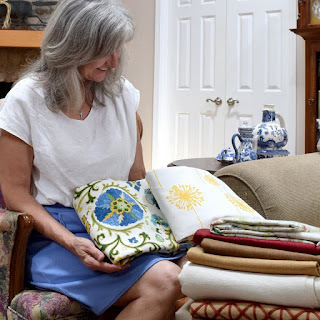 All About Fabrics, operating out of one old mill in the historic, small town of Williamston, SC has found a way to survive by selling wholesale textile goods to business customers, and opening their doors to the public 3 days out of the beginning of each month. I've lived in this area for over 27 years and decided I needed to (finally!) visit this place I'd heard so much about. After about an hour's drive from where I live, I arrived to find an old mill building turned into a warehouse facility. Their non-working smokestack is a familiar sight as every mill had a smokestack. And inside I was floored! This photo absolutely does not justify what I saw at all as there were 2 of these HUGE warehouse rooms/buildings filled with rolls/bolts of fabric from floor to ceiling and rows upon rows of fabric deep. I did not know where to begin. I walked around for at least an hour before I could get my bearings. The fabric was organized well into sections of fiber content..... linen, vinyl, jacquards, taffeta, silks.... but most was of home dec sort. These are what I brought home. The gorgeous piece of blues I'm holding in my hands will be some sort of jacket, the dandelion print will be a Lotta Jansdotter Pilvi Jacket and hard to tell but the floral linen blend you saw earlier in this post, is the tiny piece on top with different silks underneath with a couple of canvas pieces on the bottom of my pile. Hope all is staying nice and cool in the Northern Hemisphere! It is hot and humid summertime weather here! I visited the All About Fabrics web site but it doesn't look like they sell fabric online which is too bad! That beautiful raw silk for $5 a yard was an absolutely bargain - I love raw silk! I think it's one of my absolutely favourite fabrics. I made an Amelie blouse on the bias in a blue raw silk ('til the Sun Goes Down pattern) that feels so nice to wear and was a dream to sew. How wonderful that you have a good textile supplier close to where you live. I'm sure you will visit often. And your most recent shorts are gorgeous - they do sit nicely on you. This sounds like the perfect fabric outlet! I can see why you would make these shorts again. They suit you absolutely and you made them up so well with the soft facing. 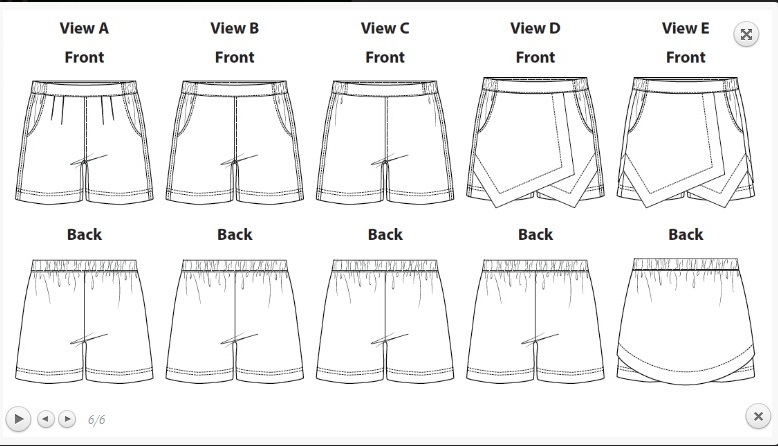 This looks like such a great shorts pattern. Absolutely love the floral linen. This is a really lovely summer outfit. You have made a fantastic fitted pair of shorts. Pretty fabric too. You are very lucky to have access to the fabric warehouse. Thank you Janine! Wearing these shorts almost daily since they were made. I am lucky, as one day there may be no textile outlet to visit. Such a great fabric store, but those shorts are really fabulous. You seem to have a whole wardrobe of shorts - marvellous!